From a Mothers Perspective..: Day TWO! 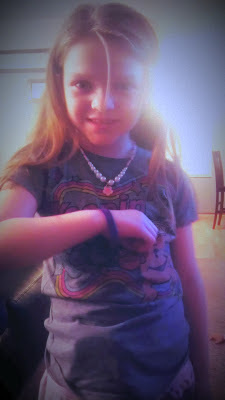 Alexis wearing her 2012 CCFA *Team Alexis* wrist band! Obviously the last 3 are not part of the #PURPLECHALLENGE, but I wanted to share... look how healthy Alexis looks! Hard to believe less than 6 months ago we were dealing with blood infusions, Remicade and extended hospital stays!